Todays blog is going to be on one of my favourite brands, Lush. Now, Lush Bromley very kindly invited me down to their store along with a group of other lovely bloggers to view their new fathers day collection. Now, although I am not a male, I do have a lovely daddy by the name of Paul and I do also have a number of guys who are part of the fashioneyesta family. 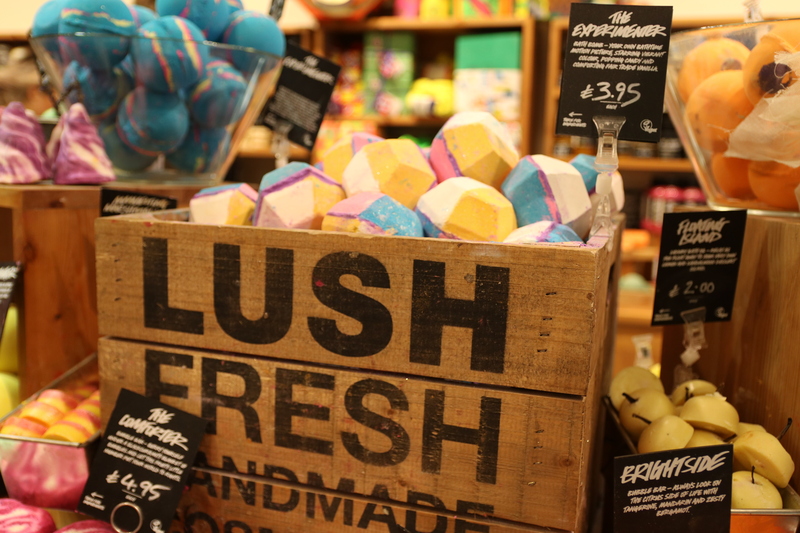 Plus, Lush is nothing but inclusive, unisex and accommodates to all genders. So, although these products are for fathers day, there is no reason why you ladies couldn’t use them yourself. Now, some of the things I will talk about have been made exclusively for fathers day. However, some things are evergreen products, but were demonstrated during the event due to the fact that they are blended with ingredients that make them unisex and suitable for both men and women. So, I will break this blog into four sections, during the event there were 4 demonstrations including products for bath, body, skin and hair. So, whether you have a dad who likes to pamper himself or a dad that is maybe a sucker for a Lush bath. I have you guys covered! Now my dad is an engineer and he gets incredibly dirty hands, so I’m sure he’d gravitate towards the shower gels, soaps and scrubs. He likes the feeling of cleanliness after a day at work. So, to start of with, we all got to make some bath products which is always a lot of fun to see what goes into the products and how they are formed into colourful shapes filled with wonder and the promise of making our bath a sensory spectacle. The first one we made was a bubble bar called Sunnyside, Sunnyside is a large bubble bar made with Lemon Oil, Sweet Wild Orange Oil and Tangerine Oil. Its an uplifting blend and one which would be a good option for guys because of its fresh scent. Although I must warn you, it is made with glitter which I know for some guys is a big no no. Well, if you’re my dad anyway. But, if you like glitter, this is definitely one for you. The next one we made was a bath bomb made with Lavender, Sea Salt, Seaweed and Lemon oil to evoke memories of seaside holidays and the smell of the shore. Its a great one for anyone who has fond memories of the beach or who likes that kind of fresh, natural scent. The first one unisex and gender neutral so there are plenty of options for your papa. The first one that was recommended is a Bath Bomb called The Experimenter made with Fair Trade Vanilla, Tonka Bean and Vetivert to make a warm, musky blend. This is a scent that has lots of depth and creates a colourful show in your bath. The next one is in fact a fathers day exclusive bubble bar called The Modfather, made with fresh notes of Brazilian Orange oil to create an uplifting bath experience. The next is again a Fathers Day exclusive and its one of the most visually exciting products from the entire Fathers Day range. Lush have released a bath bomb called Super Dad made with Sandalwood Oil and Olibanum Oil to create a woody blend. The bath bomb has been created to look like a comic strip style text in an onomatopoeic explosion in shades of bright blue, red and yellow.It creates a colourful show in the bath. 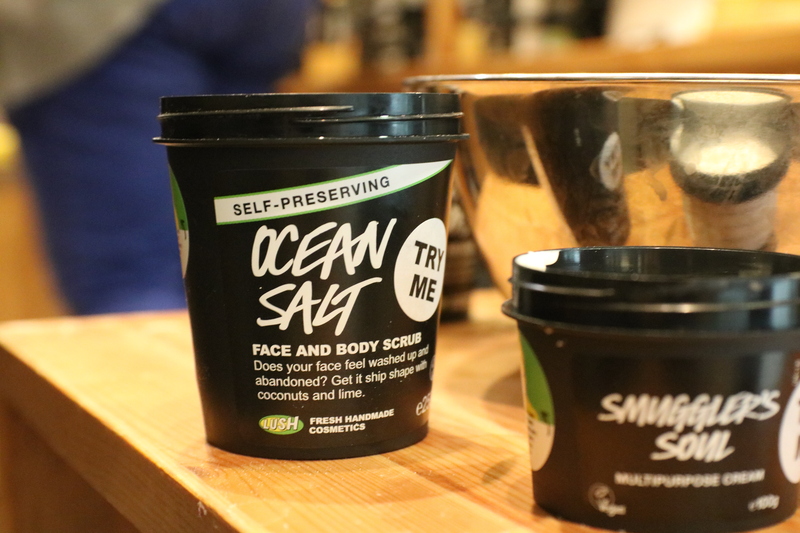 Now, we move onto body care and again Lush have brought out some exclusive Fathers Day products, but plenty of their evergreen body products are unisex and would make great gifts for your dad. The first product is a Fathers Day exclusive called the Thanks Dad soap made with a zingy blend of Fresh Orange Juice and Brazilian Orange Oil. Now I think one thing that my dad would love is a bar of soap, being an engineer he gets very dirty hands and so a fresh soap like this would be ideal. Lush’s soaps are always made with skin benefiting ingredients and thus they don’t strip the skin of their natural oils. Lush also have a range of shower gels in unisex fragrances which would be a great gift for someone this Father’s Day. Two of the shower gels which were featured during the event was Happy Hippy and Dirty Springwash shower gels. Happy Hippy is a fresh, fruity (and vegan) blend of Pink Grapefruit Juice, Bergamot Oil and Frankincense. It creates a fresh, oriental blend and is perfect for anyone who needs a little pick me up. Dirty Springwash is a minty blend of Sea Salt, Spearmint and Thyme which is great for any dads who don’t like anything too feminine in fragrance. Its a very clean scent and perfect for the Summer months. Now, we move onto my dad absolutely loves due to having a job where he constantly has to get his hands dirty. The two which were featured was the Rub Rub Rub Scrub and the Life’s A Beach Scrub. Now I have previously used both scrubs and I adore both. The Life’s A Beach Scrub is made with Fine Sea Salt, Tonka Bean, Gardenia Flower and Fair Trade Vanilla. To me, it smells like seaside holidays sitting on a beach with an ice cream and a sand castle. It brings back so many memories and is a very nostalgic smell. The Rub Rub Rub Shower Scrub is a fresh blend of Fine Sea Salt, Mimosa, Lemon Oil and Orange Flower Absolute. This was one of the first Lush products I ever used and it leaves your skin feeling clean, revived and smooth without stripping it of its natural oils. Lush also have a number of cold pressed soaps which they launched last year in their Oxford Street Store which would make great fathers day gifts. The first is called Lush Gardener and is made to keep those hands smelling lovely when you’ve had a stint in the garden planting and weeding all day. Its made with Clary Sage, Moringa Oil, Almond Oil and Eucalyptus Oil. The next is called Lush Hippy and its an uplifting blend of Sunflower Infusion, Wheatgrain Oil, Fair Trade Organic Cocoa Butter and Patchouli Oil. The third and final soap is called Lush Mechanic and its made for anyone with a lot of ground in dirt on their hands like engineers or mechanics. Its made with Pumice Powder to help remove the dirt and grime, scented with Benzoin and Rosemary and Olive Oil to soften the skin. Now we move onto the territory of skincare, because skincare is very important not just for ladies but for the men too. Lush make plenty of products to suit different skin types, age groups and genders and their products are made with natural ingredients and many use self preservatives. I have used Lush skincare products for over two years now and I have to say as someone with very picky skin due to being on hormone replacement therapy. They really compliment my skin and leave it feeling smooth and replenished. The next product is a multi purpose cream called The Smugglers Soul cream, its kind of like Lush’s version of Steam Cream in that you can use it on your face, hands and body. Its an all in one cream and it smell absolutely divine using skin soothing ingredients of Lemon Balm, Fresh Water Cress, Fresh Cucumber, Argon Oil and Sandalwood. Its very soothing and leaves a residue of oil on your skin which protects it from the environment and locks in moisture. Its in a gender neutral scent and it would work great for both males or females, even though it is a Fathers Day exclusive. Finally, we move onto haircare, these products can be used either on your locks and are also good for beard maintenance too because lets face it who wants to run their hands through a Mr Twit Beard? You know what I mean one of those beards that never get washed, conditioned or oiled. Trust me fellas, it’s not a good look. So, one of the first haircare products is not exclusively for males and its an evergreen Lush product called the R&B hair moisturiser. This is marketed as a leave in hair moisturiser for those with dry or untameable hair. But it can also be used for guys either on the hair or a beard. You take a pea sized amount and work it into the hair to keep it smooth and shiny. Its made with Oat Milk, Organic Advocado Butter, Orange Flower Absolute and Extra Virgin Coconut Oil. The next product is a Fathers Day exclusive called the Smugglers Souls Shampoo Bar. For those of you who are new to Lush, Lush make amazing solid shampoo bars which are designed so that you don’t have to have massive bottles of shampoo. They are great for traveling and for people who are on the go. Yes, they do foam up extremely well and they leave the fair feeling incredibly clean and soft. I have used plenty of them and I have never been disappointed with the results. The Smugglers Soul Shampoo bar is made with Rosewood, Sandalwood, Fresh Cucumber and Fresh Sandalwood. Its incredibly moisturising and has a very fresh scent, so great for the guys who don’t want to use a conditioner. The next product is called Veerappan, this is marketed as a moustache wax although I have been told you can use it to condition the ends of your hair to prevent split ends and breakage and you can also use it as a wax to strop fly aways. It’s made with Rose Wax, Sandalwood, Japan Wax and Tagetes Oil to help condition the hair and keep it in place. The final hair product that I wanted to mention is called Hair Custard and its a hair styling cream used to condition the hair, keep fly aways in place and tame the hair into position. It very much smells like custard and contains a lot of the fresh ingredients that custard is made with as we’ll as some others like Vanilla, Coconut Oil, Fresh Grapefruit Extract and Strawberry Juice. Its great for the guys who want to style their hair, as it makes a good substitute for gel or styling wax and its a great hair conditioner for the ladies (or guys) with long hair who want to prevent breakage or split ends. But, be warned! You only need a little bit. Another thing I love about going to these events is that I get to meet so many other lovely and really interesting fellow bloggers and share tips and tricks on blogging with them. There was some familiar faces as well as some new ones at this bloggers event and it was great to meet everyone. I have linked below all the bloggers that I know were in attendance of the event, but I fear I may have forgotten some people. So if I have please comment below with your blog link and I shall of course add you. So, that concludes my blog post for today, I really hope you guys enjoyed it. Do let me know in the comments which product you would like to try and which ones you will be buying for your dad. 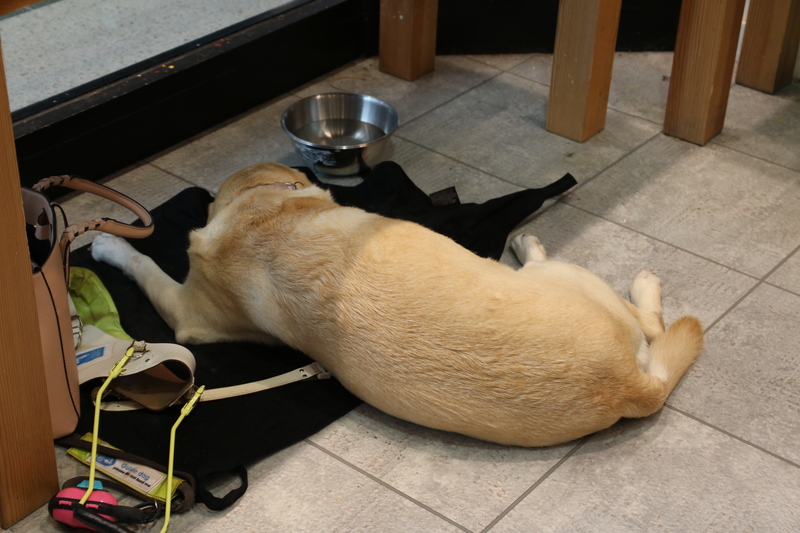 Also can I just say a massive thank you to Lush Bromley again for inviting me and for making my little guide dog so welcome. They even made her her own little cubby hole complete with towel and water bowl. Thank you all so much for reading and I will see you all in my next one!